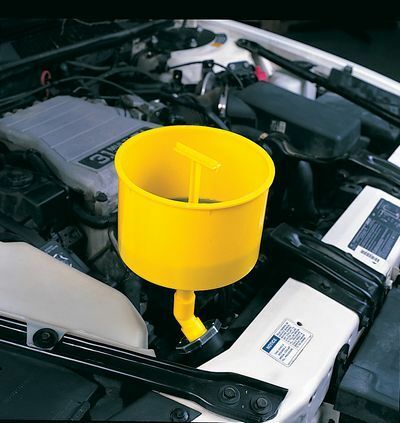 Anyone have a picture of this air bleed/relief valve in the engine compartment? I can't seem to locate it. Just for future reference just in case someone has this same problem. It is located next to the battery compartment by the firewall. I recently changed my oil cooler gasket and had to bleed my coolant system. It was really a PITA, but it was also my first time. I had enough of it so I bought a Lisle 24610 Spill-Free Funnel kit. I must say, this really helped because you can actually see it work! Every time I would rev the motor, the person watching it, told me that they could see lots of small to big air bubbles. After 30 mins I felt better knowing I did my part. I did have to top off my coolant the next morning which I checked because I truly believe you need to drive the car with the heater on and off constantly (normal driving) to get all the air out of the system. I will do this procedure again to make sure all the little air bubbles are out. Also I believe system has a way of working out the small air bubbles so be sure to keep an eye on it for a week or so. I have listed below the kit which I bought for $38 at O'Reillys Auto Part. I wanted it same day so I paid extra vs buying it off ebay for around $25. I just wanted to say thanks for posting this. I had a radiator replacement and the technician did npt bleed the air out after replacing the radiator. It worked for me after about 3-4 cycles through the process. Kind of a messy process but well worth it. I pulled enough air out of my system to put somewhere between a half and a whole bottle of coolant into my system after the air displacement was removed. I used the Lisle funnel and removed the air bleed screw the first cycle just to make sure no air was bubbling up through the air bleed screw port (lost some coolant that way) Then I replaced the air bleed screw, and left the funnel on with extra coolant in it up to the top of the funnel taper and cycled it through the reving to 3k for 10 seconds and cycling between heat and a/c for each 3k Rev cycle. Eventually heat was constant and car ran fine with no overheating. Took about an hour or so to get all the bubbles to cycle through and come up out of the Lisle funnel. Very helpful. Thanks again!